Posted Oct 18, 2018 | filed under Weekly Banding Reports. With fall migration over and owls nearing, but not at, completion, there is little in the way of updates for me to provide, but there is always something interesting to share about birds. A couple weeks ago I wrote about how birds have a very different breathing system than we have and the implications of that. Turns out people found that very interesting. I received a lot of good feedback so this week I wanted to talk about some other attributes that make birds seem like creatures out of fantasy. One of the most fantastic things about birds is their vision. And there are so many aspects of their vision that is different from ours. 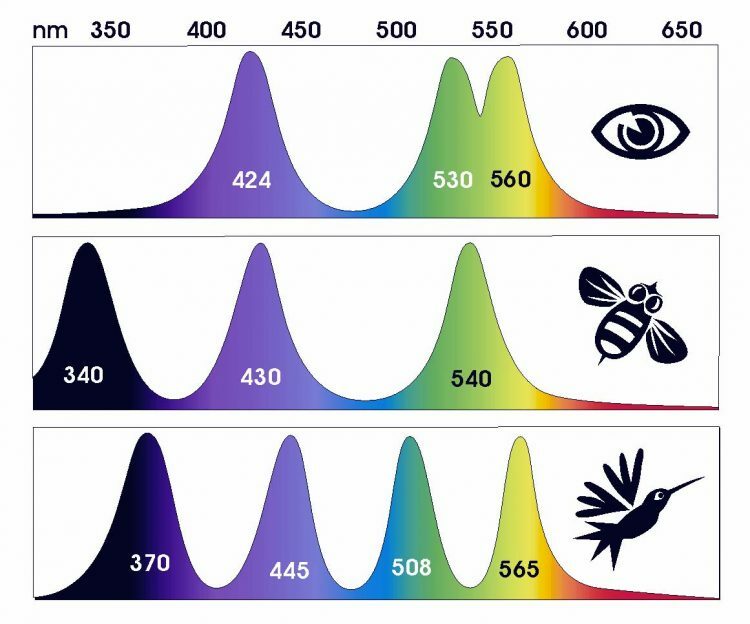 For starters birds are tetrachromatic meaning they have four types of cones and can see light in the UV spectrum. Lots of people hear that birds can see UV colours and they think ‘oh, so all the colours plus hot-pink-UV’. That isn’t the right way to think about it. The right way is to think of there being four different primary colours. So imagine all the colours you can. Picture a colour wheel and how it is a complete spectrum. That is using only three primary colours combined together. Imagine how many different colours can be created using four primary colours. Birds are seeing colours that we cannot even imagine. At least I know I cannot imagine stuffing more colours into a colour wheel. To us it is complete, to a bird it is but a tiny fraction. On top of seeing a world composed of way more colour than us birds can also see the earth’s magnetic field. They have proteins called cryptochromes in their eyes that react with blue light and essentially create a visual filter that allows them to orient themselves by the magnetic fields. Alright, so bird eyes are pretty fantastic in what they can see but they can also see all this very quickly. Human eyes can detect about 50 light pulses per second. So that means we can detect a series of light pulses as being separate up to that speed. Faster than 50 pulses per second and we would detect it as a continuous light rather than a pulse. Birds can detect pulses at rates higher than 100 pulses per second. And they can actually use this rapid onslaught of visual information. Humans have a reaction speed of approximately .25 seconds. So a visual cue is processed and it takes us a quarter of a second to do anything with that information. Birds have a reaction speed around .075 of a second which is over three times faster. Have you ever seen a large flock of birds seemingly moving as one? This is how they do it. They are able to pick up the minute beginnings of a direction shift from a neighbouring bird and react to follow at speeds that our eyes see as simultaneous. Flying in swarms birds can look like they share a hive mind but each movement is triggered by a single bird reacting to something and moving. It trusts that the whole flock will follow with it seamlessly and there will be no collisions. And that bird in turn will trust and follow if a neighbour moves. What a remarkable thing.